Director Ron Howard has sold his home in Conyers Farm for the full asking price of $27.5 million. The sale closed Thursday, according to Lyn Stevens of Sotheby’s International Realty, who listed the roughly 32-acre lakefront estate with her team, the Fieldstone Group, also of Sotheby's International Realty. The property went into contract about two weeks after its listing in early May, Ms. Stevens said. 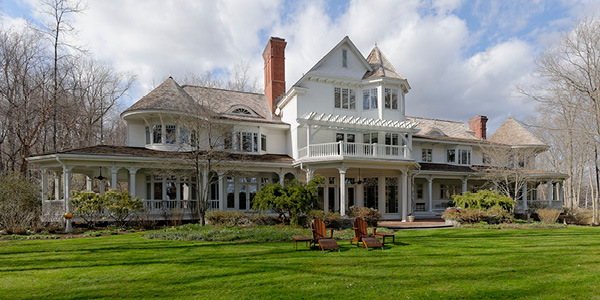 The home is located in the gated community of Conyers Farm, which straddles the border of Greenwich, Conn., and Armonk. The Howards, who have four children, bought the land in 1991 and spent years constructing the house and outbuildings. The main house, which sits on the shores of Converse Lake, is more than 17,000 square feet and has six bedrooms, five full and four half baths, a swimming pool—and, of course a home theater. There is a 2,500-square-foot guest house and a "sports barn" which includes a full-size tennis court. The property also has livestock and horse barns, paddocks and riding rings. The buyer has horses and these facilities were a selling point of the property. The Howards said in a previous interview with The Wall Street Journal that they are selling because they travel frequently and their children are grown.